Half Term Ideas in Falmouth! At the Royal Duchy Hotel we understand how important it is to make the most of your time away from home, whether it’s just for a few days or longer. Our spa facilities and luxury surroundings are designed to help you relax and recharge your batteries. We haven’t forgotten the little people, though, because we know that happy children make for happy mummies and daddies. During school holidays we make sure that children are catered for from the time they arrive with a welcome teddy bear, crayons and colouring books in your room. 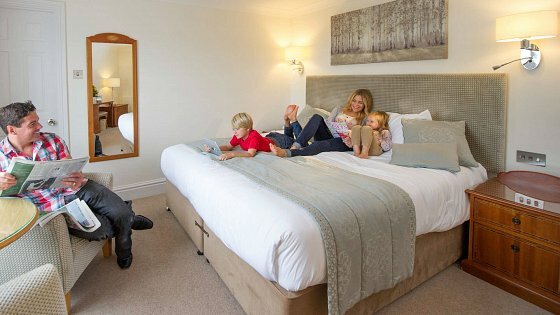 In our family room you’ll find board games, toys, books and DVDs, or they can join in with an exciting programme of activities, head for the pool or borrow buckets and spades, fishing nets and crab buckets and visit the beach, a short stroll away. Falmouth is a great place for families and, with October half term approaching, here are some ideas for keeping the children amused, come rain or come shine. Our first choice is the National Maritime Museum Cornwall which is incredibly family friendly with special activities during the half term holidays - storytelling, an Awesome Adventurers playzone and all things nautical. The museum’s motto is “climb aboard” rather than “don’t touch” and young ones could find themselves in a life raft or a lifeboat or on a jet ski. Great views from the tower at the top, or head below decks and see what’s happening underwater. Top tip: Go early (the museum opens at 10am). Your tickets (under 18s £5, under fives free) allow you to return as many times as you like in a year, so you don’t have to cram it all into one day. Trebah Gardens, around 20 minutes by car from the hotel, makes a natural playground for children over five with Tarzan’s Camp – a wooden play area with climbing ropes, slide, monkey bars and fireman's pole all under a tree canopy – and Fort Stuart with its Wild West theme for the under fives. Children's Trails (£2 per child to include a prize) take them on an adventure of discovery around the garden – just don’t tell them they might learn something too! Magnificent plants, trees and shrubs including giant gunnera and tree ferns and a beautiful water garden. Top tip: Visit the maze made entirely out of bamboos. Bamboozle zig zags alongside the stream with canes of all colours, shapes and sizes including one which can grow 30cm in 24 hours! Become your own skipper with a half-day trip on a self-drive boat from Falmouth Boat Hire. After a short lesson on operating the boat, you can head out on the River Fal to explore. From the river you can see some of the amazing buildings in the area, even land at some of them. You can spot Trelissick House, St Mawes and Pendennis Castles or Falmouth Docks and harbour with huge laid-up 20,000 tonnes ships, or simply wander along the river to watch wildlife, including herons, or try your hand at fishing. Top tip: Moor at Mylor for lunch or a cream tea and a stroll or, tide permitting, stop at the famous Pandora Inn. The Cornish Seal Sanctuary is about half an hour away but offers a packed day out discovering some fascinating creatures. Don’t be fooled by the name. Although it started as a seal sanctuary you’ll find much more here including sea lions, otters, Humboldt penguins and rockpools with sea anenomes, crab and starfish. The sanctuary is fairly level and easy for baby buggies to get around. See how seals are rescued and helped to get well before being released back into the wild. You can watch their underwater antics from the viewing area. Top tip: Visit the website (www.sealife.com/gweek) to book cheaper tickets online and check out the programme of talks and events throughout the day to make the most of your visit. Falmouth has been welcoming artists for over a century and Falmouth School of Art has a worldwide reputation for the quality of its facilities and teaching. See some of the work generated by local artists at Falmouth Art Gallery or try your hand at creating your own art. Entrance to the gallery is free (closed on Sundays) and there’s an ever-changing programmes of exhibitions and events. Work on display could come from the gallery’s permanent collection or on loan from major museums, local artists, community groups, school children and students. The staircase gallery houses art from local community groups and changes weekly. Top tip: During half term week there are hands-on art activities for young people which are free. No need to book.